A course of confidence boosting long-hair and up-style training workshops where each student will benefit from one-to-one guidance; intended to encourage rapid learning and improve stylist confidence. 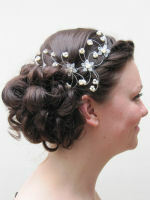 Each workshop provides step-by-step demonstration and tuition from long-hair expert Helen Tozer. The training includes hands-on practice with live models, under her personal direction and supervision. Salon stylists of all experience levels can now establish, improve or refresh their long-hair dressing techniques with coaching designed to provide inspiration and high motivation directly from a qualified, professional, expert long-hair stylist. Helen covers the basics of working with long hair and demonstrates a selection of styles ranging from soft and romantic to classic and elegant, teaching several on each day. After completing the workshop, students will feel more capable, confident and inspired; ready and eager to apply their newfound skills and techniques. Additionally, the salon benefits from being able to offer clients an enhanced and more profitable service. These convenient training workshops cut out the added extra expenses involved with out-of-salon training, such as London travel, hotel, transport and food costs. In-Salon workshop costs include tuition for up to three students. Additional students are charged extra. 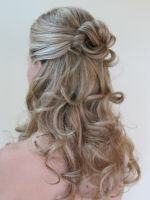 Workshops can be arranged any day to suit the client (typically on a Monday) when the salon is closed. Sunday workshops by arrangement, if required. For best results, up to six students per workshop is preferred. A workshop manual is provided, along with a certificate on completion. Out-of-Salon workshops are also available. For workshop details, please see below. This super value foundation workshop covers the basics of dressing long-hair, up styling and client care. Suitable for stylists of all experience levels who wish to develop their skills for bridal and special occasion hair styling. 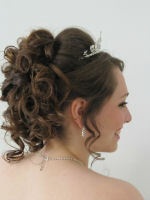 Four long-hair styles will be demonstrated and students will practice hands-on to replicate the styles. Developing on the knowledge and skills acquired in the foundation course, greater emphasis is placed on practicing the skills to perfect the styling of plaits, twists and buns. The advanced workshop continues with styling practice that concentrates on a combination of demonstration and practical. Hands-on sessions with live models allow students to perfect high smooth barrel curls, beehive, short hair-up and 50's Audrey Hepburn styling. 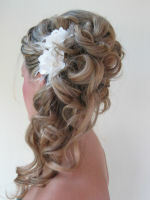 Helen Tozer also gives one-to-one tuition in long-hair and bridal styling. Enhance your skills by learning directly from an experienced, professional long-hair stylist; benefit from Helen focussing solely on your individual skills and needs. Helen will structure the day to meet your particular requirements. For further information on Bridal Hair by Helen long hair and bridal styling workshops, and to make a booking direct, please contact Helen Tozer. "Content and delivery 10 out of 10. Confident now to try different ideas... hands-on practice most beneficial." "Learnt important tips to create and work with... Helen was easy to listen to and follow." "Made me confident about preparing hair before putting it up." "Excellent! 10 out of 10. Vast amount of learning, new ideas - very relaxed and professional"
"The course was very informative and was a very good refresher"
"Full of useful tips - learnt a lot"
"Really enjoyed it and learnt a lot more than I expected. Can't wait to try it all out!" "A well planned out day ... helped me focus on all aspects to achieve the looks I was after"
"Brilliant. Very informative and good hands-on"
"Very good and helpful, easy to learn . . . Feel more confident now, very well explained . . . Very effective - amazing styles"
"I have really enjoyed the course, should have done it sooner... has left me feeling excited and confident for the future"